Although the Civil War ended almost 150 years ago, the War Between the States continues to fascinate scholars, military history savants and ordinary folks whose ancestors played some role in that great American drama. To Stephen Ellis, who lives with his wife, Diny, along Lake D’Arbonne northwest of Monroe, childhood stories of one Civil War ancestor set him upon a lifelong quest that eventually led to dusty boxes in the attic of an old house in Maine. Of all the tales, one fascinated him most. It was about his great grandfather Ezekiel John Ellis, better known as E. John Ellis. Born in 1840 in Covington, E. John was a bright young man who had studied at Centenary College, then located in Jackson (Louisiana) before going on for a law degree at the University of Louisiana in New Orleans (now Tulane University). During the Civil War, young Ellis served as a lieutenant and later captain in the 16th Louisiana Infantry Regiment, which saw bloody action at Shiloh, Murfreesboro, Chickamauga, Chattanooga, Missionary Ridge, Atlanta and Jonesborough, before surrendering in Gainesville, Alabama in May 1865. Stephen Ellis’s interest in his great grandfather’s service, however, had little to do with battles. His passion to know his great grandfather better began when his father gave him 10 letters that E. John had written home during the battles of Corinth and Murfreesboro. The rhythm of each sentence and sentiment were written in a time when words were meant to sing and convey one’s innermost emotions. They simply didn’t inform readers; they moved them. Reading these letters, Ellis fell into his great grandfather’s grip, one that would drive a passion to learn more about the man who wrote such beautiful prose about such horrific events. Writing again to his sister in May 1862, Ellis praised the justness of the Southern cause: “This contest on our part is just, and I am willing for me to wear out in the service or to die in the field before submitting to Yankee rule. Rather than this, I would be willing to live on the mud of the lake swamp, to pillow my head upon the cypress knee, to sleep with the dull eye of the alligator glaring on me and the slimy hissing of the moccasin coiled over my heart. But the time was when all of this might have been avoided. That time is passed however and it now is Freedom or the grave.” Over the years, Ellis transcribed the letters and donated the originals to LSU’s Hill Memorial Library, which houses over a hundred boxes of Ellis family papers. The most important document to connect Stephen Ellis with his great grandfather’s thoughts, however, remained illusive for many years. It was a two-volume diary that E. John wrote while a prisoner of war at Johnson’s Island on Lake Erie in Ohio. 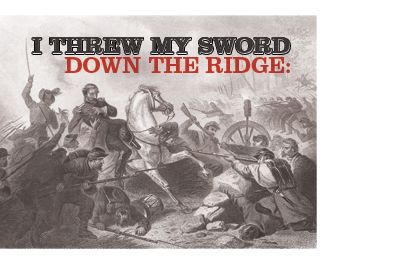 Surviving the devastating battles of Shiloh, Murfreesboro, Chickamauga and Chattanooga, Union troops captured Ellis in late November 1863 at the Battle of Missionary Ridge. “A Yankee captain demanded my surrender,” he wrote. “I threw my sword down the ridge and with very bad grade, surrendered.” Stephen has a copy of the diary that a great aunt had transcribed sometime around 1910, but no one in the family knew if the original still existed, and if it did, where it might be. While still a prisoner, Ellis refused to take an oath of allegiance as long as the war continued. “I cannot take the oath yet,” he confessed. “I do not see why I should for the Trans Mississippi Army is yet in the field; the Confederate government yet exists. My oath to it is not forgotten and I cannot forget it while the government exists either as a civil or military organization. When the Confederate government is dead, and its dissolution seems inevitable, then I will cease to be a soldier.” After Confederate General Kirby Smith surrendered the last major Confederate Army on June 2, Ellis took the oath and began his long journey down the Ohio and Mississippi rivers to south Louisiana. In a bit of irony, he reached home July 4th, 1865. The war over, Ellis went on to a successful career in law and politics during Reconstruction. After a brief stint as editor of the Amite Daily Wanderer, he set up a law practice in Covington and in 1867 married Josephine Chamberlain. The couple moved to New Orleans where he practiced law and quickly became a major figure and moderating voice in the city’s violent post-war political struggle between native Democrats and Republicans backed by federal troops. During those years, Ellis served in the state senate from 1866 to 1870 and the U.S. House of Representatives from 1875 to 1885. In Congress, Ellis was a member of the commission that negotiated the Compromise of 1877 that ended Reconstruction. Leaving Congress in 1885, Ellis remained in Washington, D.C., to practice law. He died four years later from a heart attack at the age of 49. Ellis is buried in the family cemetery at Ingleside near Amite. E. John’s diary then began its odyssey through various branches of the Ellis family. For more information about the Ellis Family Papers and E. John Ellis’s diary, visit LSU’s Hill Memorial Library at lib.lsu.edu/special/findaid/2795.inv.pdf.